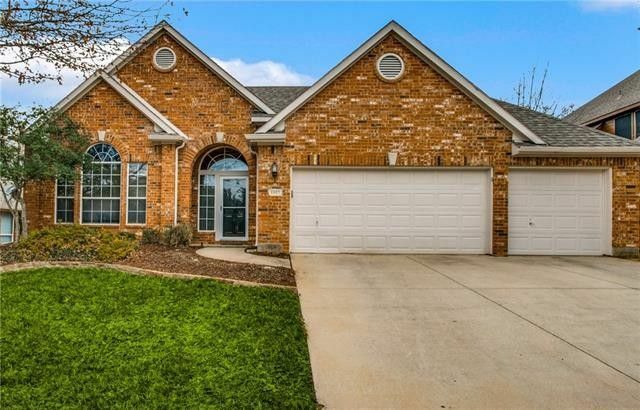 This Oakmont one-story brick home offers an ideal floorplan with 4 spacious bedrooms + a study, separated for privacy, as well as two big dining areas, & a large family room open to the kitchen's breakfast bar. The chef's kitchen offers custom 42 inch cabinets, stainless steel appliances, double ovens, gas cooktop, pantry, & breakfast bar large enough for 6 barstools! At the back of the home, the family room's big windows offer great views of the tranquil wooded greenspace & the 20X11 brand new wood deck & 22X7 patio. The private master suite offers a 9 foot deep walk-in closet, dual sinks, & separate shower & tub. The three-car garage makes this home a rare treasure! Walking distance to grade schools & park! Directions: From I-35 E, Exit 461 / Post Oak Dr., head South on Post Oak Dr., Right onto Ainsley Ct, Right onto Ledgestone Dr., Left onto Covington Lane.